Tucked away on a quaint beach just 10-kilometres north of Phuket is Iniala Beach House, a paradise retreat that takes luxury to the next level. Iniala is a set of three villas and a penthouse situated on the golden edges of the Natai reach home. The area surrounding Iniala consists of nothing but a handful of scattered private homes and a few tangled fields on one side and the deep blue Andaman Sea on the other. With the founder, Mark Weingard’s eternal philanthropic efforts for supporting those in need in Bali and Thailand; Iniala donates 10% of room revenue and 5% of food and sundry revenues directly to the Inspirasia Foundation to fund projects in Thailand and the rest of Asia. 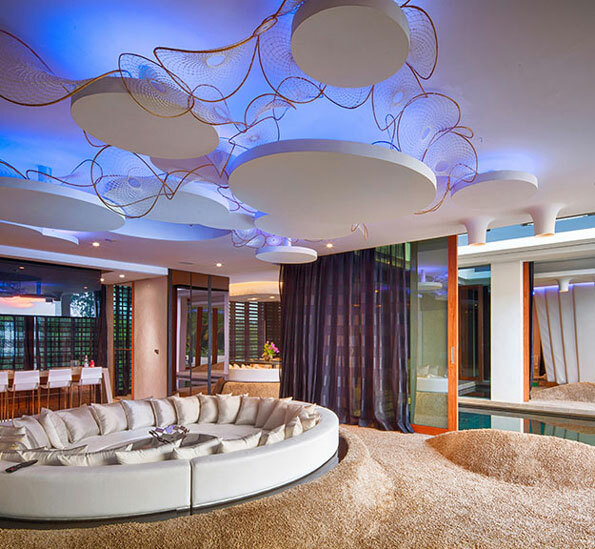 Iniala’s five-acre property consists of three three-bedroom villas and a penthouse. The stunning property has been designed by ten of the world’s most renowned architects, including Brazil’s Campana brothers and Spain’s Jamie Hayon, who were given carte blanche to create something incredible. There is even the Boudoir-themed bedroom styled by Mark Brazier- Jones, who famously designed the set for Fifty Shades of Grey. Each property has a uniqueness of its own, and together they create a stunning piece of architecture and contain luxuries abound. Small touches such as Jo Malone and Iniala’s extensive collection of artwork toiletries really sets the property apart. The penthouse is studded with floating furniture amidst a soft spongy carpet that feels like sand beneath your feet and a sunken tub. It gives you the illusion of living in the clouds with an undisturbed view of the blue sea from the windows. Villa Siam has been created with inspiration from Thai culture and Buddhism. The villa comes with its own private spa which is located within an ancient Thai bell with teachings inscribed in the walls. Villa Bianca is all white and takes inspiration from Russian Matryoshka dolls. The star of the Collector’s villa is the spectacular US$200,000 bed in the Carpenter’s Chamber that took 18 months to carve. The villa also boasts broken celadon ceramics that cover its walls. Alongside the state-of-the-art design, one can also expect unparalleled service and each villa also comes with a private butler, chef and chauffeur to name a few. Guests at Iniala can enjoy the many gastronomic experiences such as the i-Dining concept where food is personalised daily according to guests’ tastes and desires. Their chefs will discuss the options with you or you can just leave it up to them to create something wonderful based on that day’s fresh ingredients. Anything that you crave right from fresh oven baked bread to a candlelit barbeque on the beach, to a traditional Thai meal cooked by head chef Sandro Aguillero. Iniala also champions the world’s first children’s hotel consisting of treehouses and game rooms for the kids meaning that they will resist all attempts at leaving paradise for home as well as your beach bronzed selves. Prices start from $1,995 per night on a full board basis.